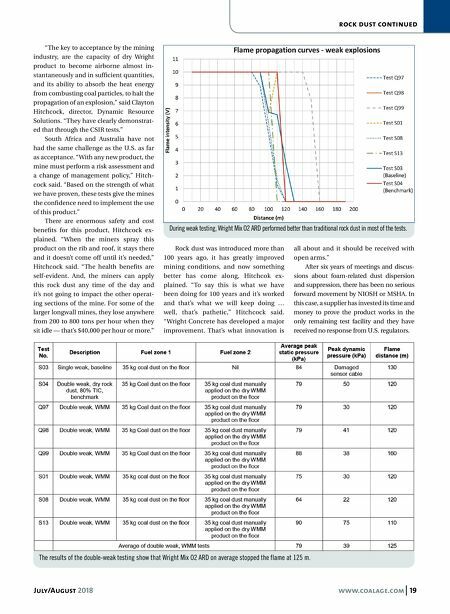 18 www.coalage.com July/August 2018 rock dust continued There is not a lot of difference between Wright's product and the others as far as the application. The Wright product, how- ever, is oxygen based and it's a one-com- ponent dry dust. "The difference in cost is less than a $0.001 per square ft compared to regular rock dust," Wright said. "Adding the water to the Wright product is not an exact science. Once the miners determine the viscosity levels they like, they can just apply it again and again." "We are the only ones in the world that have developed and tested a product like this," Wright said. MSHA, however, has not yet approved a foam-related rock dust as a permanent replacement option for dry dust. A lot of U.S. coal operators would like to use the product and NIOSH and MSHA have done nothing to support the process. "Several Australian longwall operators have heard about the South African tests and have already requested demonstra- tions," Wright said. "We will supply product to those mines and hopefully, when U.S. regulators come to their senses, American miners can start using it as a replacement for rock dust." Meanwhile, Wright is ship- ping product to South Africa and Australia. An Effective Inby Deterrent? MSHA recognizes foam-related dust as a temporary inby deterrent. In initial tests, some of the early foam products proved unsuccessful. The paste that was created and applied caked as it dried. The clumps did not break down into the fine dust par- ticles needed to suppress the explosion. The caked rock dust failed as an explosion inhib- itor and MSHA has not changed its position. 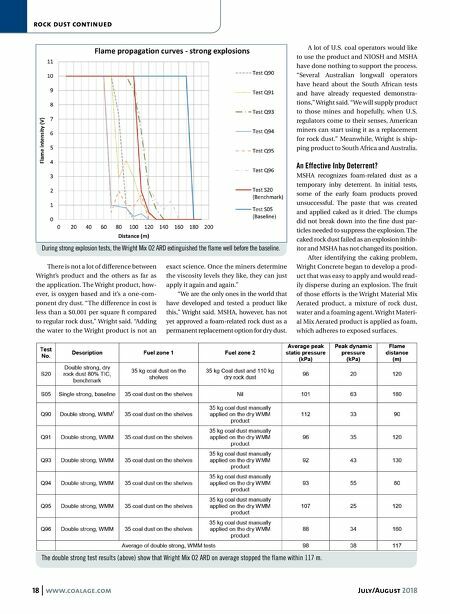 After identifying the caking problem, Wright Concrete began to develop a prod- uct that was easy to apply and would read- ily disperse during an explosion. The fruit of those efforts is the Wright Material Mix Aerated product, a mixture of rock dust, water and a foaming agent. Wright Materi- al Mix Aerated product is applied as foam, which adheres to exposed surfaces. The double strong test results (above) show that Wright Mix O2 ARD on average stopped the flame within 117 m. During strong explosion tests, the Wright Mix O2 ARD extinguished the flame well before the baseline.